My first thoughts about this buggy, bearing in mind it is only a visual of the photos. I would like to know where they think this buggy will sit in the market, certainly not the racing market, and that is where most of the money is spent….so if not the racing scene…who?….with the words “production buggy” I would assume we are talking hundreds not tens of buggies, so the pricing HAS to be right from the beginning. I love the look of the front end, although the pegs look like they are on the leading link and so will move up and down, but the info says otherwise. The swan neck is a work of art, I worry the bottom of the swan neck is too close to the ground, maybe the angle of the photo. The monocoque, well it certainly looks state of the art, but is it practical….I hope it will not be a one shape fits all or even a small Medium or large, I have spent years getting the perfect fit for my body within my buggies, a small medium and large just doesn’t cut it especially if the price is at the upper limits. The rear axle is split in two and separated by two shocks, this is quite an old format, in fact I had a similar set up on the 06 Fandango buggy, although this looks far more sleek, but the action of this type of rear suspension is the same, the buggy will tilt or lean kite side and absorb energy from the kite, this is a bad thing we have learned over the years, if you do go down this route you need an anti roll bar to stop the tilting like in a car, suspension on the rear end unless you use the desert like Sand Yeti is really not needed. The stiffer the buggy the more energy is transferred to the wheels. A composite rear axle would have been much better and lighter. I am not sure of the weight yet, but I would imagine any weight reduced from using composite materials will be lost by adding 4 shocks and all the hardware needed to house these. 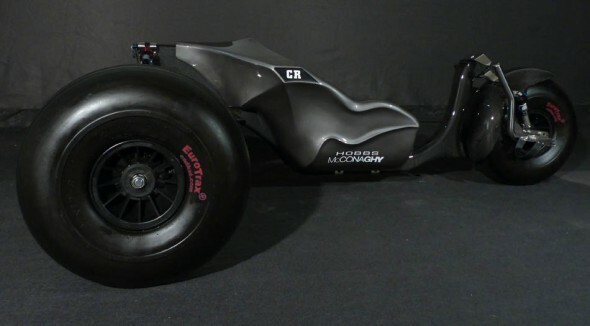 When I first saw the front end I was excited, I guessed the body would be a monocoque type design, but I did not expect the rear end to be as it is….I was if I am honest disappointed with the rear end, and I doubt the racing fraternity will have any interest in this buggy. So again I ask who will this buggy be aimed at?….the cruising running up and down the beach type of pilot, I guess that would be most of us then….I don’t know myself, I look at this new production buggy and think yes it does look modern and ground breaking, but is it any better in performance than the buggy I already have….and purely just from looking at the photos I have to say NO. I believe they are onto something in some areas….and kind of forgot about a buggy of the future in other areas and concentrated of buggies of the past…..I believe this buggy is a prototype, so hopefully after extensive testing in the next few weeks, they will have the options of tweaking a few areas. A fair critique on only a couple of photo’s! In answer to your question “where does this buggy sit in the market place” I think at this stage where you suggested in the cruiser category! however lets not underestimate that it is still an untested entity in terms of it’s chassis and axle capabilaties. We beleive it will be the stiffest chassis on the market eliminating the side tube / goose neck bracket and with the rear shocks pumped to around 250psi (300psi max) it is an increadably stiff configeration. One thing you could not see from the photo’s is rear axle trangulation – forward 340mm which also increases rigidity to the rear axles. In terms of the seat it will never be a bespoke made to measure unit. Unfortunatly this is due to massive tooling costs involved and everybody is a different shape! this is why I beleive as you will for the top end racer there will always be a place for bespoke one off buggies! The ridged seat shape does however provide an easy platform with which to shape additional foam to your size to provide a snugg fit. After consulting with other Australian buggiers we have instaled a lap belt with an optional hard wire capabiliy. Throughout the design period and after reading countless forum posts one main thought kept me thinking – to design a full size buggy that could be assembled and disassembled within a matter of minutes without tools and eliminate the need for trailers or buggy racks on the back of your car’ and for this reason the rear axles were designed as they were and not as an integeral part of the chassis which would have been actually been simpler in terms of tooling. Although it would have been fun to produce something very very different! the standard buggy configuration works and as you probably can appreciate if we had had gone crazy would we have sold any? who knows! maybe in the future! 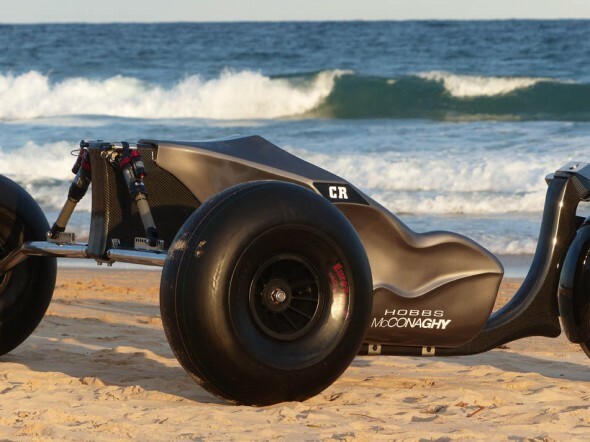 In regard to weight you are indeed correct that a proportion of weight saving characteristics of the carbon fibre has been offset by the shocks and quick realease assemblies. The prototype weighs in at 58KG however a considerable proportion of this is due to using chop strand fibre glass seat and over engineering it. I expect the production model which will use a double bias mat fibre glass will save around 5-6kg with further weight saving going into the stainless parts! Remember thou the chassis and seat combined can still easily be lifted onto the roof rack of your car! 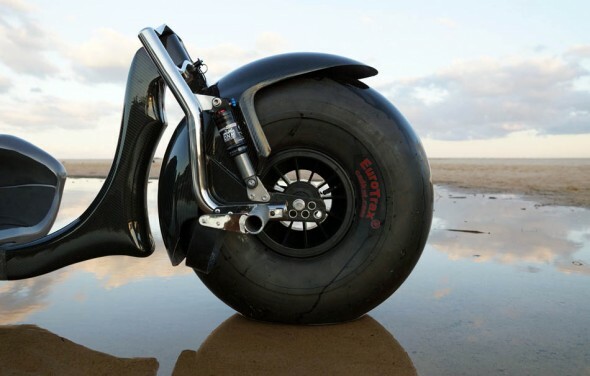 Who knows what the future holds – if enough interest was generated for a carbon fibre rear axle we may very well make it happen! The foot pegs remain static on the forks with the front swing arm assembly removing vibration and shock from the front wheel.